Dwight Lowry spent the bulk of his four-year major-league career as a backup catcher for the Detroit Tigers between 1984 and 1987, including an extended stay with the 1984 Tigers during their championship run. Aside from his early tragic death after a heart attack, he is best known as one of the relatively few American Indians to have played major-league baseball. Only 50 had donned a major-league uniform through the 2009 season, and Lowry was just the second player to come from the Lumbee tribe. (Gene Locklear, who played in 292 games for the Reds, Padres, and Yankees (1973-1977), was the first. The Lumbee tribe, from North Carolina, is the ninth largest Native American tribe in the United States and the largest east of the Mississippi River. It takes its name from the Lumbee River in Robeson County, North Carolina. The tribe’s economic, cultural, and political center is in Pembroke, North Carolina. Lowry was born on October 23, 1957, to Marvin and Berniece Lowry, in Lumberton, North Carolina, one of six children. James Locklear, editor of the tribe’s newspaper, the Robeson Journal, wrote that baseball was no stranger to the Lowry household. Dwight’s father, Marvin, played football and basketball at the University of North Carolina at Pembroke, and later played semipro baseball. Dwight got his start as a batboy for his father’s sandlot team. Following in his father’s footsteps as an athlete, Dwight was Pembroke High School’s starting quarterback in football, a starting forward for the basketball team, and the baseball team’s best hitter and starting catcher. He earned Three River All-Conference team honors in all three sports and in his senior year batted .480 as he helped lead Pembroke to a 21-3 record in baseball. Pembroke lost to the defending state champions in the state semifinals in 1976. Lowry turned down a football scholarship from Clemson University to play baseball at the University of North Carolina. He played baseball for four years there and earned a degree in industrial relations. During his senior season, 1980, Lowry earned first-team All-Atlantic Coast Conference honors, and the Tar Heels came within one win of taking the ACC championship. In June 1980, Lowry was drafted in the 11th round of the amateur draft by the Detroit Tigers. The Tigers’ first-round draft pick that year was Glenn Wilson, and while Wilson went on to play in 1,201 major-league games and was an All-Star outfielder, he’s mostly known as one of the players Detroit traded to acquire Willie Hernandez just before the 1984 season. Lowry was one of six Tigers draftees in 1980 to reach the major leagues. Lowry struggled in his first season in the Tigers’ minor-league system. After being drafted, he reported to the Lakeland Tigers of the Florida State League. Under manager Ed Brinkman, Lakeland finished in last place in the North Division of the Class A league. Lowry hit just .197, with 28 hits, 21 walks, and 22 strikeouts in 142 at-bats. Lowry started 1981 with the Class A Macon Peaches (South Atlantic League), managed by Tom Kotchman, just three years older than himself. While he didn’t struggle as much as he had the year before, he also hadn’t found his power stroke yet. He hit .251 with two home runs in 231 at-bats and was eventually promoted to the Double-A Birmingham Barons, where he hit just .154 in 19 games to finish up the season. In 1982 and 1983, Lowry began to show major-league promise. In ’82, he was back at Lakeland and spent the entire season there. He also had the advantage of playing for manager Bruce Kimm, who had been a major-league catcher. Lowry had his best season yet. He finished with a .277 batting average in 93 games. He hit seven home runs and led Florida State League catchers with eight double plays. For Lowry, 1983 set the stage for his eventual rise to the major leagues. He played in 90 games for the Birmingham Barons, who finished with a 91-54 record and won the Southern League championship. Lowry batted .267 with a career-best nine home runs in 288 at-bats, driving in 44 runs and scoring 42. Future major-league catcher Bob Melvin was his platoon partner. Teammates Nelson Simmons, Roger Mason, and Carl Willis all made their debuts in 1984 for the Tigers, as did Lowry. In the February 27, 1984, issue of The Sporting News, writer Tom Gage mentioned Dwight Lowry and Melvin as long shots to make the Tigers that season. He noted that the Tigers already had three catchers on the roster, perennial All-Star Lance Parrish, veteran John Wockenfuss, and Marty Castillo. But during spring training Wockenfuss was traded with Wilson in the deal that brought Willie Hernandez and Dave Bergman to Detroit. Although Castillo made the team, he spent most of the first two months of the season backing up Tom Brookens at third base. Bob Melvin’s time didn’t come until 1985, leaving the backup catching duties to Lowry. The 6-foot-3, 210-pound catcher made his major-league debut on Opening Day, April 3, at Minnesota. With the Tigers safely up, 8-1, over the Minnesota Twins, he replaced Parrish behind the plate for the final three innings. He didn’t get an at-bat that game, nor did he get to hit in his next two games as a defensive replacement. On April 13 he got his first big-league plate appearance. After replacing Parrish again, Lowry grounded out to second base. Lowry made his first start on April 22, at home against the Chicago White Sox, but his first hit still eluded him, as he went hitless in three at-bats. On the 24th, in the first game of a doubleheader against the Twins at Tiger Stadium, Lowry singled in his first at-bat. In the fifth inning, he drew a walk and later scored on a single by Alan Trammell. The next month turned out to be both a high point and a low point for Lowry. On May 20, he belted his first major-league home run, in the second inning of a 4-3 win over Lary Sorensen and the Oakland Athletics. The blast helped the Tigers to extend their record-breaking start to 32-5. But the homer was Lowry’s last hit for Detroit until September. On June 8 the Tigers sent him to their Triple-A affiliate, the Evansville (Indiana) Triplets, and called up his Barons teammate from the year before, Carl Willis. The three summer months were a disappointment for Lowry. In 61 games for Evansville, he hit just .220 and his 51 strikeouts in 177 at-bats were the highest strikeouts-per-at-bats rate of any of his minor-league stints. But he was called back up in September. His two-run home run on September 29 helped the Tigers rout the New York Yankees 11-3 for their 104th victory, a franchise record. 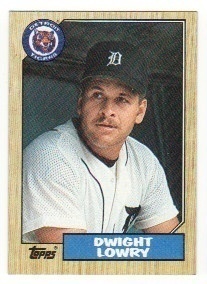 Lowry wasn’t on the post-season roster, but his father said being with the 1984 Tigers was one of the biggest thrills of Dwight’s life. If 1984 was a high point of Lowry’s career, 1985 was probably one of the lows. Marty Castillo started the season as the Tigers’ backup catcher. This move gave Sparky Anderson some versatility because Castillo could also play third base, where he had spent almost half his time for the Tigers in 1984. Lowry spent the season with the Nashville Sounds of the American Association. In late May the Tigers brought up a catcher, but it was Bob Melvin, Lowry’s Nashville teammate. Lowry, meanwhile, had the worst season of his career. In 74 games and 203 at-bats, he hit just .182 with two home runs and 13 RBIs as Nashville finished in second place in the East Division of the American Association with a 71-70 record. But Lowry’s 1986 season put him back on the Tigers’ map. He was called up from Nashville in May to back up Lance Parrish, then when Parrish went on the disabled list with a back injury, Lowry became the primary catcher. He was eventually backed up by Mike Heath, acquired by the Tigers on August 10. In Lowry’s first chance as a big-league starter, he finished the season with a .307 batting average in 150 at-bats. He also set himself up as a potential starter for the 1987 season after Parrish signed with the Philadelphia Phillies in the offseason. Unfortunately for Lowry, three things kept that from happening. The first was the emergence of Matt Nokes, who had hit well in each of his seasons in the Tigers organization. Nokes hit .285 and drove in 71 runs for Nashville in 1986 and impressed management enough for them to carry three catchers to start the 1987 season. Also hurting Lowry was the presence of Mike Heath, an above-average defensive catcher who also gave the Tigers a veteran presence at the position. The final straw was Lowry’s bad start; in eight games in April, he went 4-for-22 (.182) with one RBI. He became the odd man out when Sparky Anderson decided to keep just two catchers. Lowry was sent to the Tigers’ new Triple-A affiliate, the Toledo Mud Hens. There he was a backup too, and hit just .194 although he found his way back to Detroit as a September call-up. He got into five games as a pinch-hitter or defensive replacement and in his final game singled in his only at-bat in a 10-9 loss to the Toronto Blue Jays on September 26. It was Lowry’s last major-league hit. In the same week that the Tigers lost their American League Championship Series to the Minnesota Twins, they released Lowry. A week after being released, Lowry was signed by the Twins. Lowry started the season with Minnesota, but he was mostly used as a defensive replacement or pinch-hitter, starting just one game in April, then was sent to the Twins’ Triple-A team, the Portland (Oregon) Beavers. Portland finished in second place in the Pacific Coast League’s Northwest division that year as Lowry mostly backed up Tom Nieto and filled in at first base. He finished the year with a .258 batting average with 33 runs and 32 RBIs in 244 at-bats. As with 1987, though, Lowry found himself on a team without a need for him and was cut shortly after the season ended. He was 30 years old. In 1989, no major-league team was interested in Lowry, and he went overseas to play in the Italian professional league. During the winter, he played in the short-lived Senior Professional Baseball Association in Florida. Then he caught on with the Indianapolis Indians, the Triple-A affiliate of the Montreal Expos. Lowry had 11 hits in his first 25 at-bats and finishing the season with a .310 batting average in 30 games. After the season, Lowry, 32, decided to retire as a player. He returned to the Tigers’ organization as a coach for the South Atlantic League’s Fayetteville (North Carolina) Generals, Detroit’s low-A affiliate. Under manager Gerry Groninger, the 1991 team finished near the bottom of the standings. But Fayetteville was less than an hour’s commute from his family in Lumberton. In 1992, Lowry returned to Fayetteville. One of the Tigers’ top prospects, pitcher Justin Thompson, spent the season with the Generals and the team finished with a 74-67 record, good for fifth place in the South Atlantic League. In 1993 former Tigers shortstop Mark Wagner managed the Generals, who made the playoffs for the first time with Lowry as a coach; they lost in the semifinals. In 1994 Lowry was named the manager of the Bristol (Virginia) Tigers, a short-season Rookie-level team in the Detroit organization. But before the season started, Fayetteville manager Wagner was promoted to manage the Lakeland Tigers, and Lowry was named to replace him at Fayetteville. The team struggled with a 62-75 record. The next season, the Generals had a league-best 86-55 record, but didn’t make the playoffs because they didn’t win either half of the split season. Lowry followed that up with a 76-63 record in 1996 and because of an expanded playoff system (the league expanded from two to three divisions) and with the help of top prospect Gabe Kapler, the Generals made the playoffs but lost in the first round to the Delmarva Shorebirds. Lowry was named the Tigers minor-league manager of the year. In the offseason the Tigers changed their affiliation at low Class A level to the West Michigan Whitecaps of the Midwest League. Lowry became the Tigers’ roving minor-league catching instructor to start the 1997 season, then managed the Jamestown (New York) Jammers, the Tigers’ short-season A-ball affiliate in the New York-Penn League. Less than a month into the Jammers’ season, tragedy struck. Early in the morning of July 10, 1997, Lowry collapsed and died of a heart attack. He was 39. Later that season, the Tigers named their Player Development Man of the Year Award after Lowry. In 1998, he was inducted into the South Atlantic League Hall of Fame. Lowry was survived by his wife, Pam; his son Zachary; and two daughters, Sesilie and Amanda. He is buried in the Bear Swamp Baptist Church Cemetery in Littleton, about a mile from his home. Gillette, Gary, and Pete Palmer, eds. The ESPN Baseball Encyclopedia, 5th ed. New York: Sterling. 2008. Johnson. Lloyd, and Miles Wolff, eds. Encyclopedia of Minor League Baseball. Durham, North Carolina: Baseball America. 1997. The Sporting News Official Baseball Register 1988. St. Louis: The Sporting News. 1988. Locklear, James. “Dwight Lowry’s Story.” Robeson Journal, 2007. “Pembroke Ends Season, Loses to Tigers 5-3.” Robesonian, June 6, 1976. Pembroke, Williamston Meet in Semis Tonight.” Robesonian, June 3, 1976. “Three Rivers Honors All Conference Team.” Robesonian, May 20, 1976. Williams, Don. “Lowry Was a True Man of the Game.” Lubbock Avalanche-Journal, July 14, 1997.